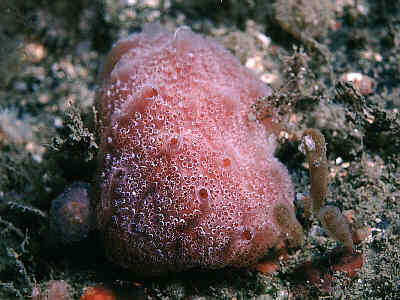 Description: A colonial ascidian forming firm, flattened globular masses. The colour is striking, with large white papillae around the inhalant siphons of the zooids and deep pink colouration of the colony. The arrangement of the zooids gives a meandering pattern, with exhalant canals between zooids leading to a few large exhalant openings, like oscula. Colony 50mm broad x 15mm thick. Habitat: On moderately exposed rocky sites, usually with moderate tidal streams, attached to rock surfaces. Distribution: A southern form in the British Isles, apparently confined to the south coasts of England ranging north to County Wexford in SE Ireland. Similar Species: This species is superficially similar to Morchellium argus, but is not stalked. The red form of Aplidium nordmanni is very similar, but the pattern of pigmentation and arrangement of zooids is quite different. See also Sidnyum sp. which has similar internal anatomy. 8 (not 6) conspicuous white papillae around the inhalant siphon of each zooid. Large firm colony with basal attachment. Colony with exhalant canals running between zooids, and few, large exhalant openings. Picton, B.E. & Morrow, C.C. (2016). Sidnyum elegans (Giard, 1872). [In] Encyclopedia of Marine Life of Britain and Ireland.